For anyone that has read our blog over the past year, I don't post too often and focus more on the "behind the scenes" elements of the site, but lately I've learned a few basic things in the kitchen that I've noticed many people on the Internet question. So today I bring you instructions for cooking a perfect hard boiled egg. With so much to think about with how high the stove should be, how long the eggs should cook, there are a lot of opinions out there. There are no doubt different methods that will achieve boiling the egg, but you don't want an egg that is undercooked or overcooked. *Next put the pan on the stove and set it to "high"
*Let the eggs sit on high until the water is at a "rolling boil," meaning you see large bubbled coming up and burst at the surface of the water. *When you see the water is at a rolling boil, turn the stove down to "medium" right away, and let the eggs sit at medium for 10 minutes. *Let the eggs cool off for around 20 minutes, and you're all set. This method makes a great egg that's shell is more easily removed than eggs I've dealt with in the past, and the inside is cooked to perfection. Try out this basic method for cooking a hard boiled egg, and let us know if you got the same great result in the comments below! I think you might have left off the most important point. 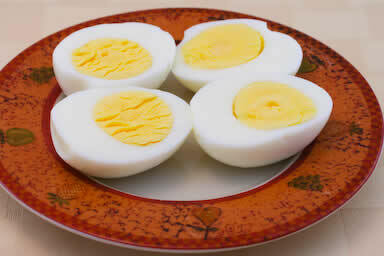 To get a hard boiled egg to peal easier, let the eggs sit in your refrigerator for a few days. Fresh-fresh eggs, hard boiled, are a bear to peal.